Vancouver, British Columbia (FSCwire) – Rockhaven Resources Ltd. (TSX-V:RK) ("Rockhaven") is pleased to announce the first results from its 2016 exploration program at the 100% owned Klaza gold-silver property, located in the Dawson Range Gold Belt of southern Yukon. The first phase of the work program is now complete and included 8,422 metres of diamond drilling in 44 holes, 800 metres of excavator trenching and an induced polarization (IP) geophysical survey. A large, intense IP chargeability anomaly that corresponds with an area of known porphyry-style copper-gold-molybdenum mineralization. 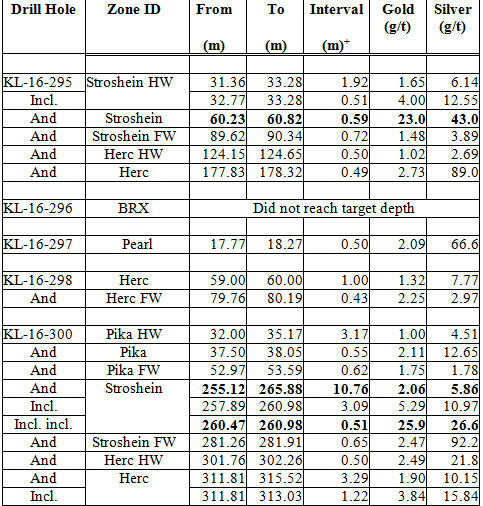 Assay results have been received for five holes from 2016 drilling. Highlights include two holes that identified a new zone (Stroshein Zone), which lies between partially delineated resource blocks in the eastern portion of the Klaza vein system. Assays include 23.0 g/t gold over 0.59 m in Hole 295 and 25.9 g/t gold over 0.51 m within a broader zone of 5.29 g/t gold over 3.09 m in Hole 300. The Stroshein Zone is open along strike and to depth. After receiving the assays, Rockhaven added five holes at the end of the program to better define this structure. Additional results will be announced upon the receipt of assays. The following table lists the highlight intervals and other significant intersections from the announced holes. + Represents the sample length. True widths are estimated to be approximately 80-90% of the interval. HW and FW represent subsidiary veins intersected in the hanging wall (HW) and footwall (FW) of each respective zone. A Volterra-3D IP survey was completed at the Klaza property to better define the Kelly Zone, where porphyry-style mineralization had been inferred from a few widely spaced drill holes, strong soil geochemistry and a broad magnetic low. The survey identified a 2,400 metre by 2,200 metre sub-circular chargeability anomaly containing greater than 40 millisecond (ms) values. Within this anomaly there is a 1,700 metre by 800 metre core with greater than 50 ms values. North-trending resistivity lows (less than 100 ohm-m) coincide with the core of the chargeability anomaly. Two diamond drill holes, spaced 950 metres apart, were drilled to test parts of the porphyry system. Assays from these drill holes are not yet available. Maps pertaining to this news release can be viewed at the Rockhaven’s website at www.rockhavenresources.com. Additional results will be released on a target by target basis once assays are received, compiled and evaluated. All analyses for rock and core samples from the 2016 program were performed by ALS Minerals with sample preparation in North Vancouver or Terrace and assays and geochemical analyses in North Vancouver. Core samples were routinely analyzed for gold by fire assay followed by atomic absorption (Au-AA24) and 48 other elements by inductively coupled plasma-mass spectrometry (ME-MS61). Samples that exceeded the detection limits of the routine methods were assayed for silver, copper, lead and zinc by inductively coupled plasma-atomic emission spectroscopy (Ag/Cu/Pb/Zn – OG62) and gold by gravimetric analysis (Au-GRA22). Rigorous procedures were in place regarding sample collection, chain of custody and data entry. Certified assay standards, coarse reject duplicates, field duplicates and blanks were routinely inserted into the sample stream to ensure integrity of the assay process. All of the results reported have passed the QAQC screening. The 2016 program was managed by Archer, Cathro & Associates (1981) Limited (Archer Cathro). Technical information in this news release has been approved by Matthew R. Dumala, P.Eng., a geological engineer with Archer Cathro and qualified person for the purpose of National Instrument 43-101.